1. Whisk cake flour, baking powder and salt in a medium bowl. In a separate large bowl, whisk melted butter, sugar, buttermilk, eggs, and vanilla. Add your dry ingredients into your wet and whisk just until combined. Try not to over mix or else your batter will be tough. 2. Butter or spray your donut pan and preheat oven to 350 degrees. 3. Add the donut batter into a large piping bag and fill each donut cavity until ¾ of the way full. If you don’t have piping bags, don’t worry—use a spoon instead. Piping bags just give you a more even distribution. Bake the donuts for about 5-6 minutes, or until a toothpick comes out clean when inserted. 4. Let the donuts cool in the pan for about a minute, then flip onto your work surface and let them cool. Repeat until all of your batter is baked. 5. Make the glaze. Mix the powdered sugar, 2 tablespoons milk, butter and vanilla in a small bowl with a spoon until no lumps remain. You want the glaze to be very thick, but still slightly movable. 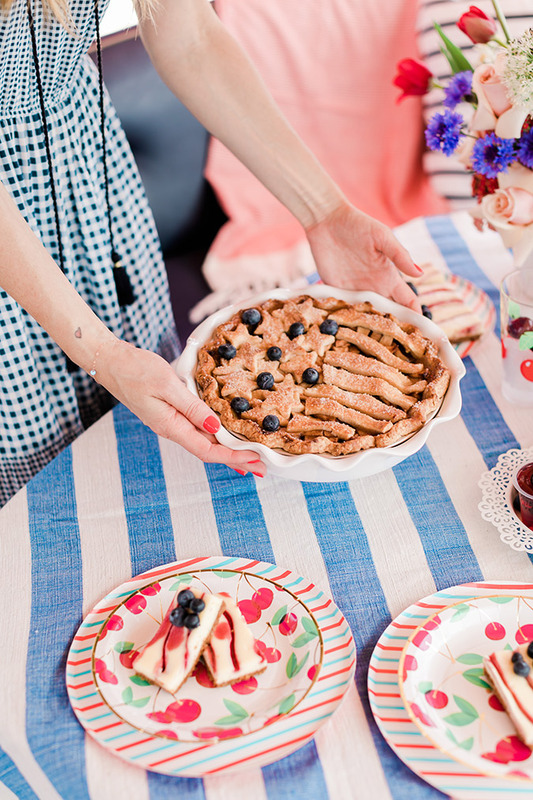 Tip: Make sure to keep your glaze covered with plastic wrap when you’re not using it because it will form a crust very quickly. 6. 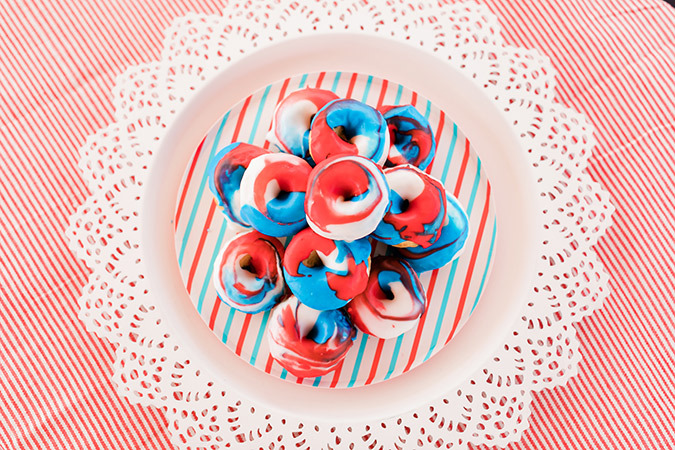 Divide the glaze between three bowls and color two of them red and blue with your gel food coloring. 7. Add each color to separate piping bags and cut the tips off. 8. Place your cooled donuts on a cooling rack on top of parchment paper. 9. Working with one donut at a time, pipe a small amount of each color glaze onto the top, so the whole top is covered. Then swirl the 3 colors together lightly with your finger. You want the colors to have a slight swirled pattern to them. 10. Let the glaze harden and enjoy! 1. Melt butter in a saucepan. Add flour to form a paste. 2. Add water and sugar and bring to a boil. Turn the heat down and simmer for about 10 minutes. You want the sugars to be melted in and no longer grainy. Note: You don’t want to turn this into a dark caramel sauce, just a good sugar/butter mixture that caramelizes once baked. 2. Mix apples, sugars, flour, and cinnamon all together in a bowl. 3. Roll out your pie dough circles and add one into a pie pan. Add the apple mixture into the pan and drizzle caramel sauce over apples. Cover with another crust and flute the edges. 4. 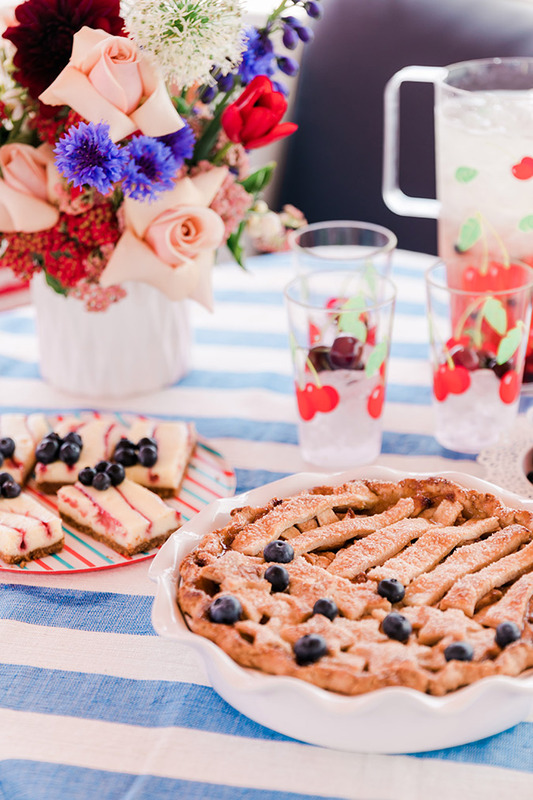 Use a star shaped cookie cutter to cut out shapes for the top of the pie. 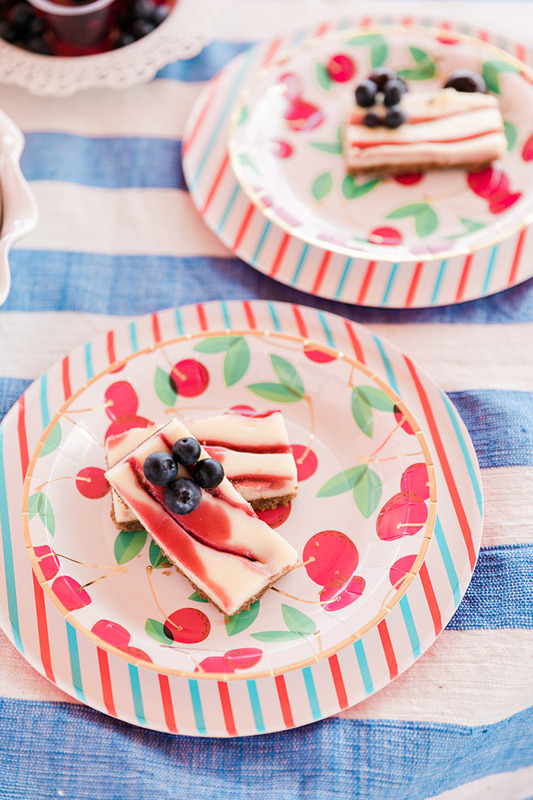 Cut out long rectangles for the top of the pie as well; these will be the stripes to your stars! Place them on top of the pie crust. 5. Brush top of pie with egg wash and sprinkle with sanding sugar. Bake the pie for 15 minutes. Reduce heat to 350, and bake for an additional 35 to 45 minutes, or until the top is golden brown and the juices are bubbling. 2. Spray a 9×13 inch baking pan with cooking spray. Cover the entire pan (with extra hanging off the sides) with aluminum foil. Then spray the foil with cooking spray. 3. Melt the butter in the microwave or on the stove top over medium-low heat. Add in the graham cracker crumbs, salt, and cinnamon. Mix until everything is combined. 4. Add the graham cracker mix into the pan and press firmly into the bottom. 5. Place the crust into the freezer or refrigerator while you make the filling. 6. Add cream cheese and sugar to a food processor and process until completely mixed together. Tip: If you don’t have a food processor, you can use a stand mixer fitted with a paddle attachment. Just make sure to beat the cream cheese and sugar first to get rid of all the lumps. 7. Add in all of the other ingredients and process until combined. 8. Add the filling into your pan on top of the crust. 9. 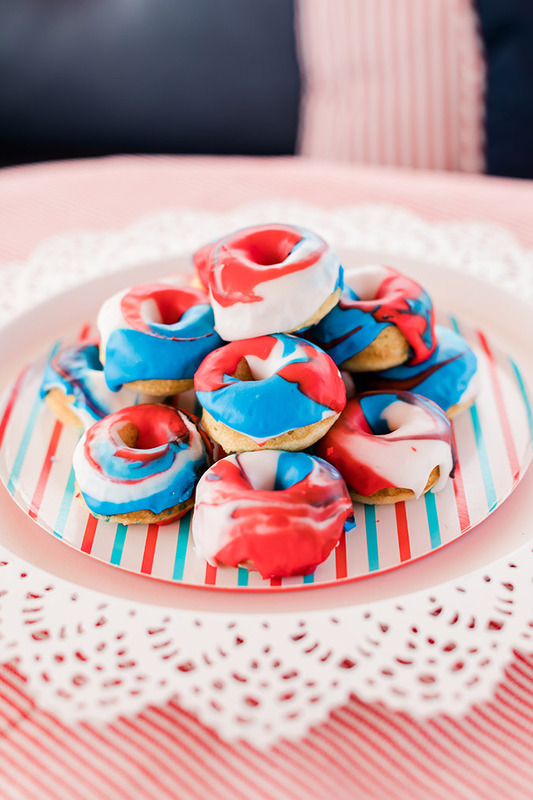 Add strawberry jam to a small piping bag and make swirls (like the flag) across the pan. 10. Bake the cheesecake in your preheated oven for about 35 minutes, or until the entire top is no longer wet to touch. Only the center should be slightly jiggly, and the edges puffed. 11. Let the cheesecake cool for 30 minutes. Then pop in fridge and chill completely, or about 3 hours. 12. Once cheesecake is chilled, pull it out with the foil overhangs. Place onto a cutting board and cut into small rectangles. 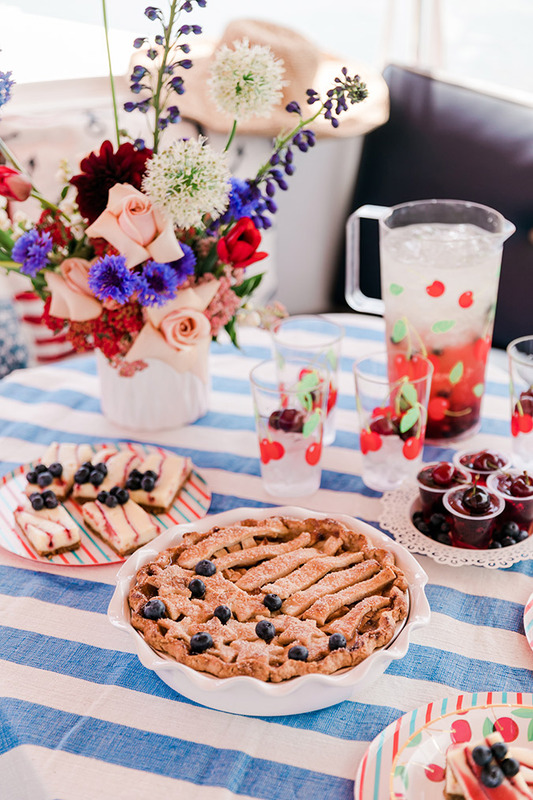 Add 4 fresh blueberries to the top lefts of each to resemble a flag. 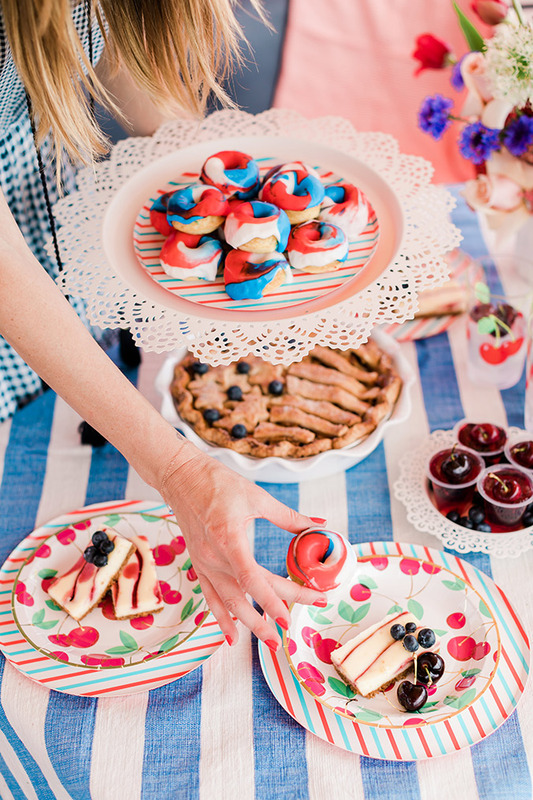 What sweet treats are you planning on whipping up this Independence Day?